Cities in six islands from CPMR member regions are involved in a major new project that aims to develop innovative new initiatives to improve local tourism and transport without damaging the environment. 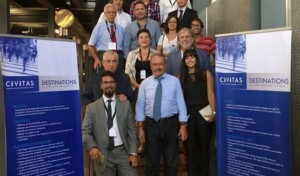 DESTINATIONS, a four-year sustainable mobility project co-financed by H2020, involves insular cities in six CPMR member regions: Madeira, Canarias, Malta, Crete, Tuscany (the communities of Rio Marina & Portoferraio on the small island of Elba) and Cyprus. The project, which held its first meeting in Funchal, Madeira on 14-16 September 2016, is aimed at involve other CPMR regions that are willing to implement its tools, methods and intelligent urban mobility solutions. This will be done through a platform of followers that will be coordinated by the CPMR secretariat in Brussels. , project coordinator and President of Horrarios de Funchal, Eduardo Jesus, Regional Secretary of Tourism and Transport of the Government of the Autonomous Region of Madeira, Marcel Rommerts, Head of Unit, Horizon 2020 Transport research, INEA, European Commission, Zoritsa Urosevic, representative of the World Tourism Organisation to the United Nations in Geneva, and Carla Carvalho Dias, Founder of the Top Service Academy. Both Alejandro Gonçalves and Eduardo Jesus highlighted why and how the project was going to improve both residents and visitors lives in regions where half of the GDP is coming from tourism. Zoritsa Urosevic outlined the areas of cooperation that can be further discussed between the WTO and DESTINATIONS. She invited the project to join the International Sustainable Tourism Observatory (INTSO) network, advising that pilot project could be created to monitor tourism sustainable mobility. Carvalho Dias focused on changing people’s mind sets. She explained that transport is part of everyone’s lives at all levels and we are constantly taking decisions such as where to go and how to get there. To improve transport attitudes and habits, she underlined that we have to understand how decisions can be influenced; and a first step is influencing attitudes and decisions through positive experiences. On the second day of the meeting a high level political round table discussion was held, involving the political representatives from the 7 DESTINATIONS cities. They all gave their views on common challenges they face and how the project could help overcome them. They all agreed to support the project activities in each one of their communities and be actively involved in further common discussions through a Political Steering Committee. The next project meeting will take place in Rethymnon, Crete at the end of April 2017.